Pastoring is a difficult calling. Those who commit their lives to pastoral ministry commit to a tough, tough job. I’m convinced there is nothing quite like it. There are other jobs that require more precise skill and longer training. There are other jobs that demand longer hours. There are other jobs that require more exertion. But somehow, when taken as a whole, I can’t imagine a more difficult vocation. That is especially true for the pastor who takes the lead role within a church. What makes pastoral ministry so difficult? I think there are many factors. Satan hates the church and knows that he can destroy the church by destroying its leaders. For that reason, spiritual leaders tend to face his strongest and most pointed attacks. Pastors face a multitude of issues and are expected to bring wisdom to bear on each one of them. One day the pastor may need to bring comfort to grieving parents, the next day to bring counsel to an addict, and the day after to interview and hire staff members. Pastoral ministry remains the one job for which a man is qualified not by his skill but by his character. Where other jobs are driven by results, pastors are qualified and evaluated primarily on the basis of their godliness and spiritual maturity. Pastors face constant scrutiny. Week by week they bare themselves before their congregation and week by week they face critique and rebuke. Often the most withering attacks come from those they love the most. But despite all the difficulties, there may be no other job as satisfying. Certainly there is no other vocation to which God attaches greater significance. It is a glorious calling not despite the difficulties, but because of them. I thank God for pastors. Consider this book as an outstretched helping hand from a pastor a little further along in the journey than you—a pastor who experienced his first years of ministry just a decade ago. Those memories and challenges are still fresh in my mind. I hope this freshness, along with some seasoning through experience as the years have passed, will provide ready wisdom and aid to those just beginning this journey. Much of this book draws on advice mentors have given me over the years, but some of it is what I wish I had known and unfortunately only learned by experience. In forty-eight short chapters he provides counsel on knowing and heeding God’s call, on starting out strong in ministry, on the pitfalls young pastors face, and on the joys of ministry. The biggest section is comprised of very practical tips and pointers on a selection of pressing issues: caring for family, reading, leading, busyness, friendship, suffering, and many more. 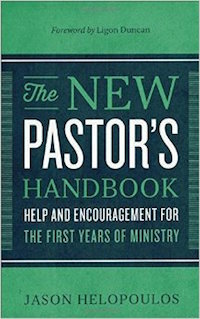 If you are in pastoral ministry (and especially if you are newly in ministry) or if you are considering pastoral ministry, I know you will benefit from reading The New Pastor’s Handbook. Ultrapractical and stuffed full of timeless wisdom, this is a book I will recommend often and reread regularly.